Lately, it’s been extremely challenging for many students to find the right choice of universities and courses offered in preferred countries such as Australia, USA, UK, Canada, New Zealand Ireland etc. Students dwell in doubts over choice and counselling being offered to them. There are left with more questions than solutions, which isn’t really helpful. Many students have related similar experiences to STORM Overseas about how they are more often than not thoroughly confused when they don’t receive accurate, updated and valued counselling on apt courses, the right country including the University of their preference. It is an undeniable fact, that many overseas education consultancies have miserably failed to fulfil the aspiration of students desiring to study abroad. What does this mean really? Well, there are many reasons we can deliberate on, yet truthfully speaking, most of them lead to no suitable solution. 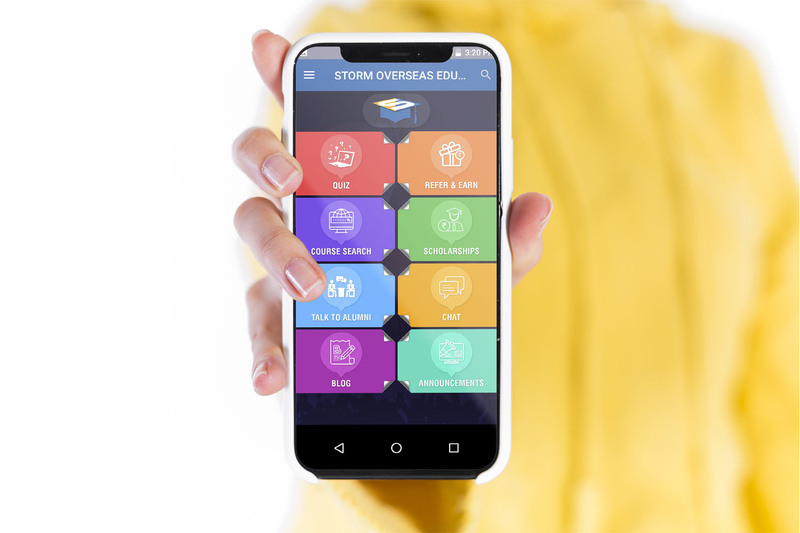 Hence, after a keen understanding of all these issues and for the benefit of students overall STORM overseas has researched well and created a one-stop-solution to bridge the gap between students and universities through the STORM APP. Hundreds and hundreds of students have found this app so useful, informative and very engaging as well. 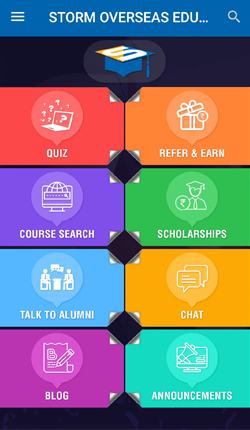 The Storm app is so huge that you can spend an entire day contemplating Universities with one another, get endless course fee details, explore eligibility criteria, hundreds of courses, read our highly anticipated weekly blogs, talk to our alumni, live chat with our counsellor, and even take apart in the quiz and earn prize money. You could also refer friends and earn. So, there’s so much to do. If you haven’t already, make sure you download the latest version of STORM app from Google Play. It’s 100% free to download and use! Once you download and open the app, Series of options pops up on the home screen. The home page lets you access several of STORM’s services without even looking up from your phone! 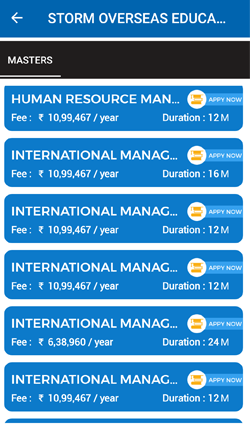 When you tap on ‘Course Search’, you will be taken to the following screen. 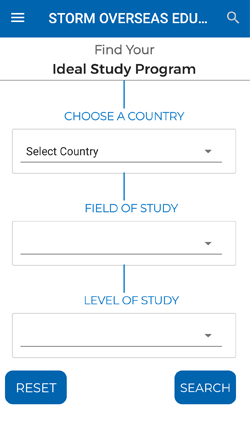 Where you can select the country of your choice, subject area and study level. 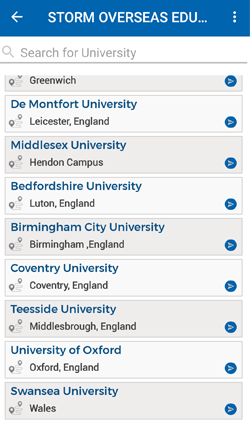 In the example given below, I’ve selected view options for business and management and opted for postgraduate as a level of study for the country UK to demonstrate the possibilities of this search. After hitting ‘Search’ on the previous screen, you will be shown several options. 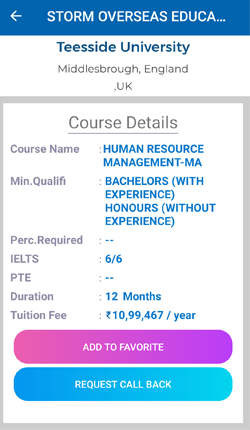 Click on any of the universities of your choice to view crucial details like course start date, entry requirements, etc. You can also add it to your favourites for either later reference or comparison with other courses by clicking on ‘Add to Favourite’. To be honest, this is the hardest of them all! The universities represented by STORM are top-ranking and offer fantastic courses. So, it can be hard to pick a programme to study. However, our counsellors are on hand to help you make that decision. Click on the ‘Request call back’ tab and a counsellor will call you in no time and take you through the options available. You also have an advantage of understanding the university better by going back to the home page and selecting ‘Talk to Alumni’, you can speak to students currently studying the course or have already graduated in the course which you are planning to pursue. You could also find out the career prospects in details course information and make an informed decision about your future.